Beautiful complete condo install. 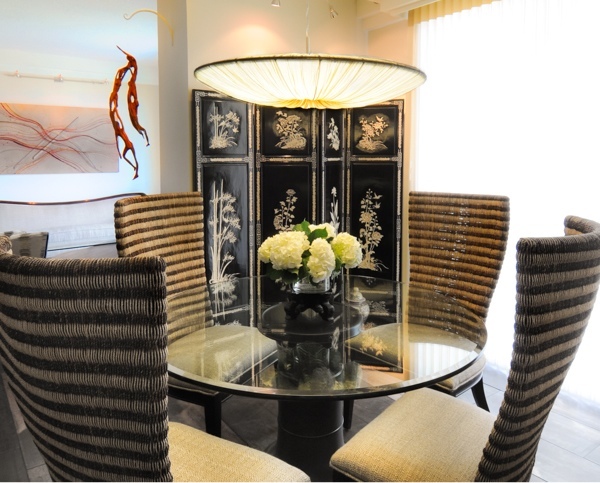 Custom doors and tables make this home a piece of functional art. Interested in learning more? Contact Nancy today. These remarks refer to the remodeling of a downtown Sarasota condominium in 2012. In remodeling our kitchen and living area we had three objectives. The ﬁrst was to design a unique kitchen that does not look like a kitchen, but like furniture. Second. 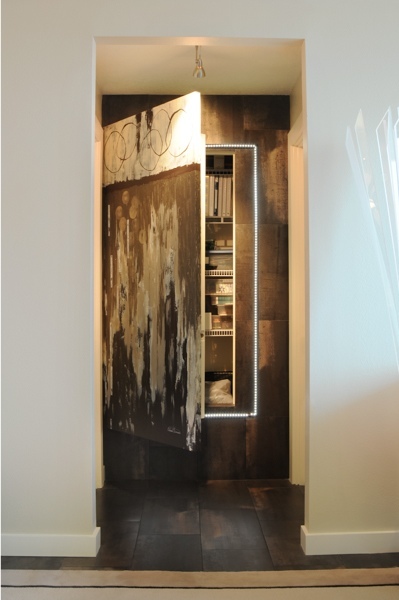 the task was to integrate our collection of eclectic an objects into a contemporary design and finally, mask ﬁve doors and frames in a way that they do not intrude into our living space. 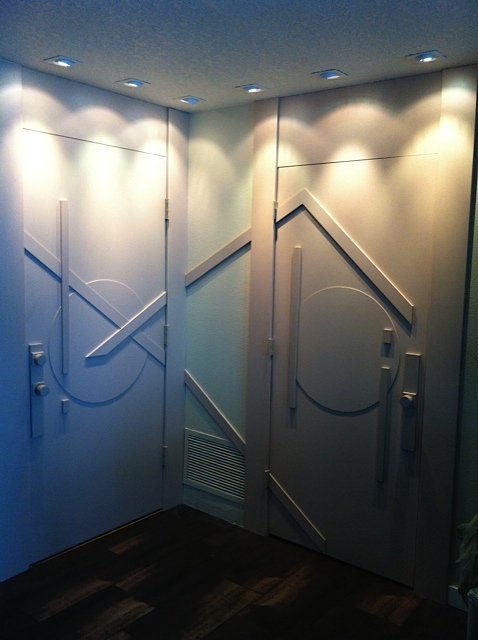 The result we expected was the creation of a warm, harmonious, comfortable experience. 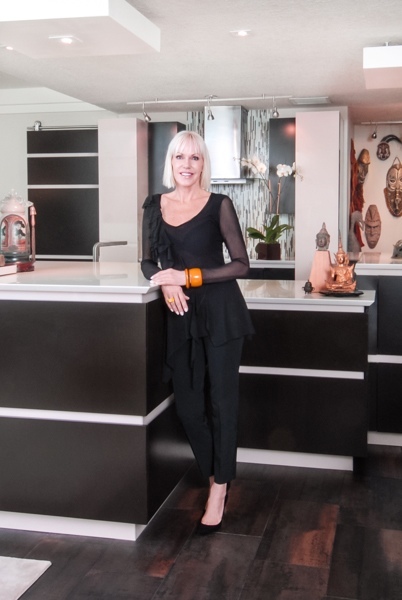 Ater interviewing three other interior designers, we selected Nancy Cameron Design. 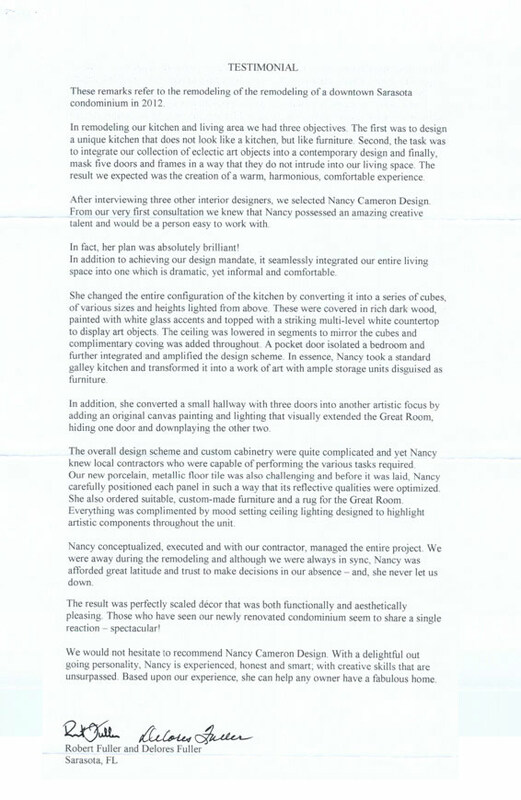 From our very first consultation we knew that Nancy possessed an amazing creative talent and would be a person easy to work with. in fact, her plan was absolutely brilliant! ln addition to achieving our design mandate, it seamlessly integrated our entire living space into one which is dramatic, yet informal and comfortable. She changed the entire conﬁguration of the kitchen by converting it into a series of various sizes and heights lighted from above. 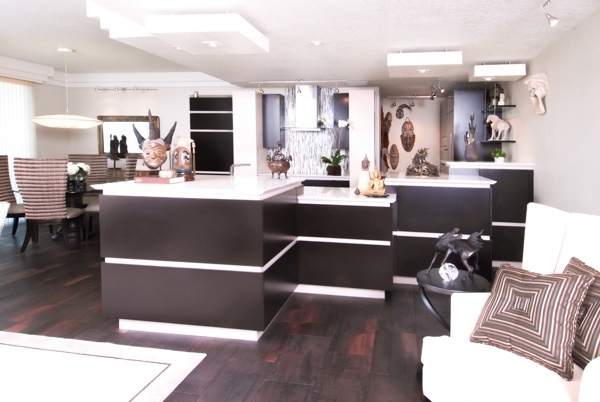 These were covered in rich dark wood, painted with white glass accents and topped with a striking multi-level white countertop. to display art objects The ceiling was lowered in segments to mirror the cubes and complimentary coving was added throughout. A pocket door isolated a bedroom and further integrated and ampliﬁed the design scheme. 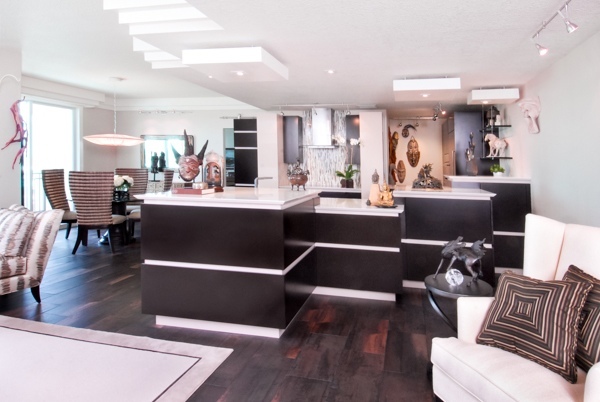 ln essence, Nancy took a standard galley kitchen and transformed it into a work of art with ample storage units disguised as furniture. 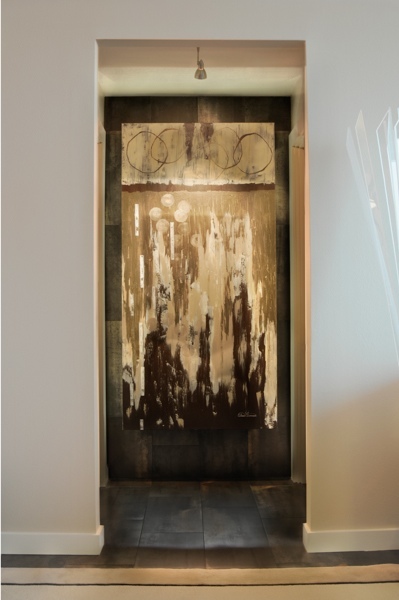 ln addition, she converted a small hallway with three doors into another artistic focus by adding an original canvas painting and lighting that visually extended the Great Room, hiding one door and downplaying the other two. 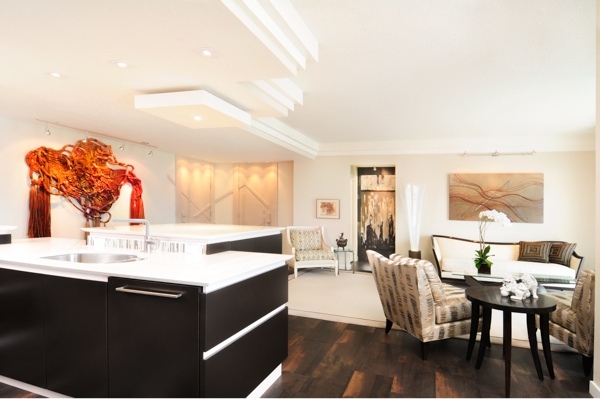 The overall design scheme and custom cabinetry were quite complicated and yet Nancy knew local contractors who were capable of performing the various tasks required. Our new porcelain, metallic ﬂoor tile was also challenging and before it was laid, Nancy carefully positioned each panel in such a way that its reﬂective qualities were optimized. 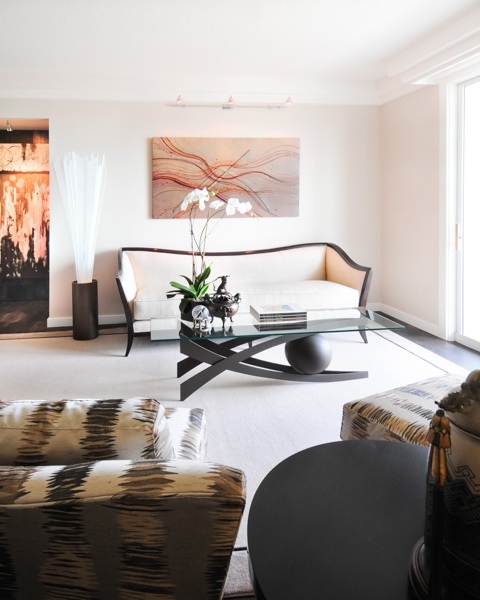 She also ordced suitable custom-made furniture and a rug for the Great Room. 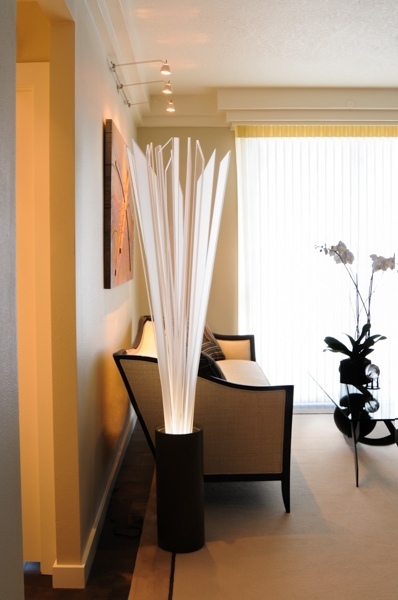 Everything was complimented by mood creating ceiling lighting designed to highlight artistic components throughout the unit. Nancy conceptualized. executed and with our contractor managed the entire project. We were away during the remodeling and although we were always in sync, Nancy was afforded great latitude and trust to make decisions in our absence – and she never let us down. plensing. Those who have seen our newly renovated condominium seem to share a single reaction – spectacular! going personality. Nancy is experienced, honest and smart; with creative skills that are unsurpassed. Based upon our experience. she can help any owner have a fabulous home. WASHINGTON D.C., January 10, 2010 – Nancy Cameron Interiors has been selected for the 2009 Best of Sarasota Award in the Interior Design category by the U.S. Commerce Association (USCA). The USCA “Best of Local Business: Award Program recognizes outstanding local businesses throughout the country. Each year, the USCA identifies companies that they believe have achieved exceptional marketing success in their local community and business category. There are local companies that enhance the positive image of small business through service to their customers and community. Welcome to our new web-site which includes this informational Blog. 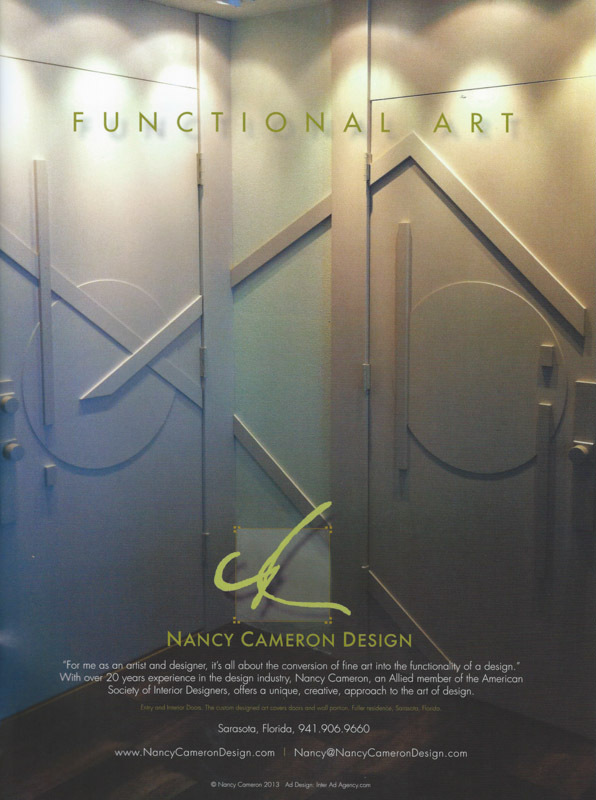 Nancy Cameron Design offers a unique approach to the art of design. Nancy specializes in the custom development of the entire project that often begins in the conceptual phase between architect and home owner.